Travel to Xinjiang’s Four "Great Lakes"
Mention the name “Xinjiang” and most people who know their Chinese geography picture vast deserts crossed by dirty looking camels and a beating sun. It’s a nostalgic picture that was made popular by the famous Silk Road but it’s a stereotype Xinjiang can’t seem to shake. The truth is that these immense deserts are locked in by incredible mountain ranges and watered by a multitude of lakes and rivers. Some of these lakes provide the most breathtaking scenery that Xinjiang has to offer. Although there are many lakes that dot the Xinjiang map, there are a couple that will give any person living or traveling to Xinjiang a chance to break away from the normal tourist destinations and find themselves in a place that would make a professional photographer leap for joy. Welcome to Xinjiang’s four “Great Lakes”. The most well-known of Xinjiang’s lakes is Heavenly Lake (aka 天池 “Tian Chi”) located only a short distance from the capital of Urumqi. Although it boasts beautiful scenery including the lofty “Peak of God” (Bogeda Feng), the main draw of Heavenly Lake is how easily accessible it is. A little more than an hour by bus makes it a simple day trip that is light on the wallet. Over the years the locals have learned that tourism brings in big money however, so much of the lake has unfortunately become very commercialized and ripe for rip-offs. Don’t let this discourage you! 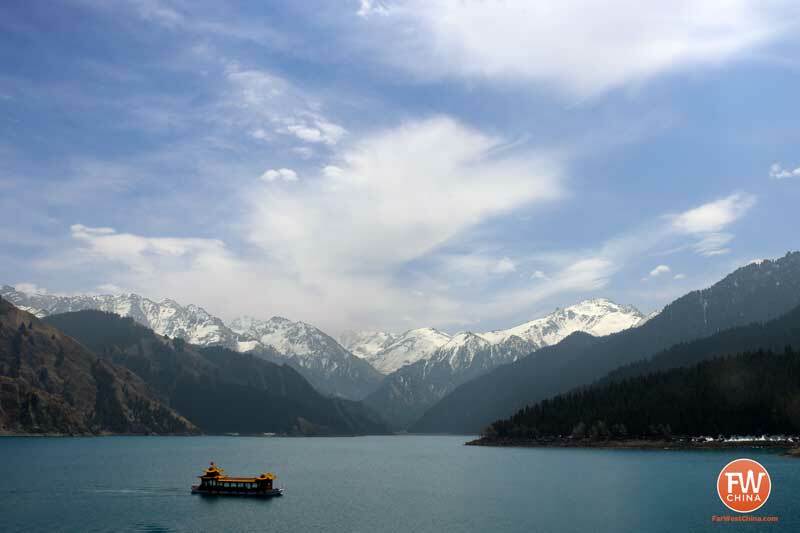 Heavenly Lake is a must-see if you don’t have time to travel deeper into the heart of Xinjiang. Around here you’ll find plenty of Kazakh yurts (or gers) which offer very cheap and exciting overnight accommodation. During the day make sure to get in a good hike or two, enjoying a break from the polluted air that plagues the nearby capital of Urumqi. 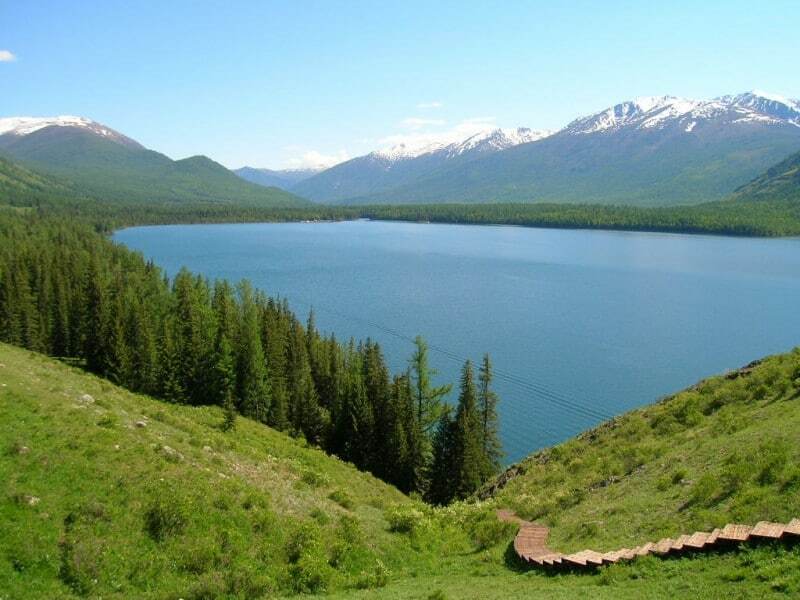 Xinjiang’s most famous lake aside from Urumqi’s Heavenly Lake is Kanas Lake, located within a large natural reserve in the Altay region near the Russian border. In actuality this lake is but a wide portion of the glacier-fed Kanas River, but it makes up for it small size by being one of the deepest lakes in China (about 190m at its deepest). Traveling to Kanas will run around 10 hours from the capital by car, so spending the night near the lake is a must, but the experience is worth the time. Hiking trails, crystal blue water, and even a Loch Ness-like lake creature are enough to keep you busy for days. Accommodation along the lake and in the nearby town is famously over-priced, but like the Heavenly Lake you can usually find yurts to rent. Although officially against area policy, many people have been known to bring their own camping equipment and avoid overnight costs altogether. This area used to be closed during the winter but with the recent upgrade of roads and addition of an airport in the nearby town, Kanas now hosts a small winter festival in January. The best time to visit would be during the spring or fall. Karakul Lake, which literally means “Black Lake” in the local language, is anything but black. I’ve personally witnessed the water changing colors from light purple to a glowing blue and it really is spectacular. The lake’s location along the Karakoram Highway near Kashgar makes it a wonderfully secluded place where very few tourist tend to travel. At the foot of the Muztag Mountain lies a small village whose buildings are still made of mud and brick, a great place to buy a hand-made wool carpet from Kyrgyz locals. As always, be prepared to spend the night in a comfortable yet rustic yurt. The area surrounding the small Karakul lake isn’t quite as green as the other three lakes, but there is still plenty to do. While most every lake offers some sort of horse or camel riding experience, Karakul is one of the few spots where you can completely circumnavigate the lake in less than a few hours on horseback. It’s also possible to hire a guide to help you climb the neighboring mountain, but their safety record is less than desirable (3 deaths in 2008 out of only 300 climbers according to one local). 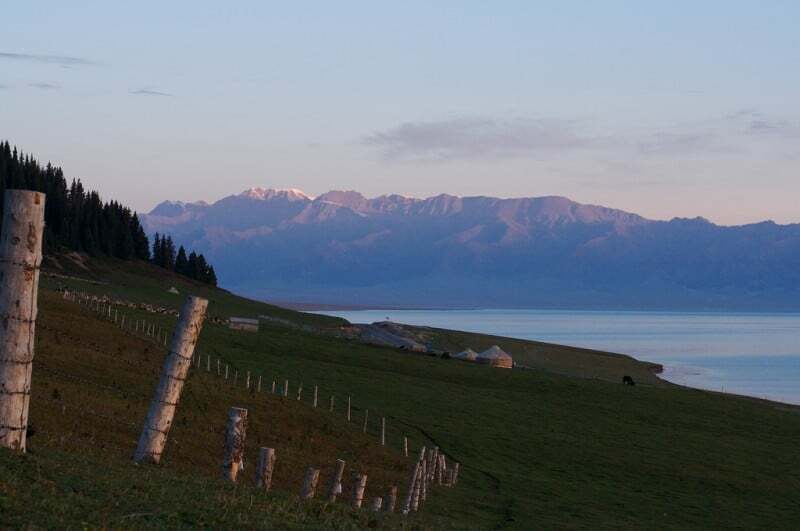 Along the road from Urumqi to the beautiful grasslands of Yili county it’s almost impossible to miss the grand Sayram Lake. During the summer months the magnificent background of mountain scenery creates a beautiful contrast to the lush green meadows where you’ll likely find herds grazing. Even today this lake has been able to avoid too much tourism and retain plenty of local flavor. Even still – as always – yurts are available in the warm months. Because of it’s close proximity to Yining (120km north), this lake makes a great rest stop on your way to or from Urumqi. Get out, take a few good pictures like the one below, and get on your way. Traveling to Xinjiang? Find out which China Travel book is best for YOU! Thanks for posting this. I’ve been to 2 of them — Tianchi and Karakul. Tianchi was in 1992. We went from the parking lot side of the lake to the opposite side by horseback. Very scary, but gorgeous. I went to Karakul in late October and nearly got snowed in. Would love to go back to both sometime, as well as visit the others. Thanks for reading, Jo! They really are gorgeous lakes, and I’m glad you got to visit them. I completely agree with you that safety can be an issue – but that’s true for a majority of tourist places in China. They don’t have to worry much about being sued! Late April is the very beginning of the travel season and it will definitely be cold at night, but there should be yurts available! I’m actually going to be publishing an article about tips for staying in a yurt next week, so stay tuned. Silly question on Tianchi: if you decide to spend the night there, is it easy to get out in the morning? Or do you have to wait for the tourist groups to arrive and take their return bus? I visited 2 out of 4 and they are really beautiful. I wish you have more pictures to show the world. Hey josh. came across your blog about xinjiang. I am planning to visit there in a few weeks and I am in a dilemma about whether to spend the night at karakul lake. I really want to but I have to go onwards to tashkurgan and the fear that no driver will pick me up keeps haunting me! I would love to meet with you when I come to urumqi, if thats ok.
Hey Josh, great info! I’m in Xinjiang at the moment and have visited tianchi already and plan to visit karakul. Trying to decide between sayram and kanas lake as I only have time for one unfortunately. Which one would you recommend?? Also a separate question if that’s OK : would you say turpan is the best place to go camel trekking? Personally, I loved Sayram Lake – much less crowded with tourists than Kanas Lake is. Have you purchased the FarWestChina Xinjiang travel guide, Chris? It’s over 400 pages of extremely useful travel info that I’ve put together and if you don’t like it, I’ll even refund you the money so you don’t have anything to lose. Great, Shelah! The only lake that might need a permit is Karakul Lake. You can’t easily stay the night here and in some cases you need permission to travel the Karakoram Highway (you’ll need to check with a travel agency because this changes often). Enjoy your trip and don’t forget to buy a copy of the FarWestChina Xinjiang travel guide to help you plan!